Rob has invited me to write a guest post as an ‘Ask me Anything’ learning experience for students in his current program. I’m honored to be able to participate! If you’d like to know more about my background, feel free to visit my LinkedIn profile or my Portfolio. Online program management can definitely be an adventure. Sometimes I show up at work and ask myself which law we’re going to break today. There are so many rules and requirements from competing stakeholders, that it’s nearly impossible to run an online course or program without breaking some of them. Much of my work involves negotiating political minefields and treading lightly around fragile egos. I love my job! I’ll share a brief story about something that happened just yesterday, and then feel free to use the comments section of this post to Ask me Anything. Often with online programs, we count on third party partnerships. We currently use a state consortium model for shared online courses between the 34 community and technical colleges in Washington. One of the options in this consortium is for our college to pay an instructor to teach a system owned shared course where students from other colleges can enroll. We pay the instructor, and our college collects instruction fees from colleges where participating students are enrolled. A student who is enrolled in this class has not taken part in the class all quarter. The only assignment I’ve received is posted under Exam 4 where the student submitted an x-rated photo of one of their body parts. Adventure time! To resolve this issue, I had to take into consideration everything from student discipline to concern for a safe environment for instructors. The instructor is remote. I don’t have access to the course because it is hosted by the consortium. The student is enrolled at another institution. It took many sensitive communications to get the system rolling to take care of this situation. Feel free to leave comments and questions and Ask me Anything about my adventures in Online Program Management. For class, this week we have been reading about systemic change in education. For our assignment, we were tasked with creating a charter school based on beliefs about effective learning models. After some thought, I think that the guiding principles for my school are: personalization, innovation, and the fostering of 21st century skills. For each student a personalized education would be tantamount. In my school, I see personalization manifesting itself in two ways: First, I would like to utilize adaptive and personalized learning systems. As an instructor, I spent a lot of time trying to fit my content to all the of prerequisite knowledge/learning levels of my students. By utilizing an adaptive tool in our classroom, we could let the technology work with the student individually and bring them to a level of mastery (an emphasis on mastery of competencies would be important in the school, rather than an arbitrary time schedule — I agree with Reigeluth, that this is a systemic problem that our schools face). These personalized engines can create a virtual “zone of proximal development” and pull a student along in the learning process. My idea is to use adaptive learning technologies to help students establish baseline knowledge in much of the same way a textbook is supposed to work. There would still be planned teacher activities, but hopefully the adaptive systems would help the student gain mastery in a given topic more efficiently. The other aspect of personalization is that the design of the school would allow students the freedom to pursue a course of study that is interesting to them. This personalization could be accomplished in a few possible ways. One way is that while, students across a class would likely be learning the same base level of content in general areas (Mathematics, Language), the structure would allow students to apply their knowledge to areas that interest them. This would hopefully allow their learning in those broader subject areas to be quickly tied into their area of interest. Another possible method of personalization could be done through self-directed learning. While self-directed study would only take up a portion of the day, it would be a good opportunity for students to work on planning, goal setting, and meta-cognitive strategies. This would hopefully also promote learner autonomy in the students, and would help them foster abilities for lifelong learning. Students could take a general class that interested them (for instance: electronics), but they would draw up contracts with their instructors to create a path to their selected goal. In my experience trying to place students in job, I’ve seen the need for more and more innovative, strategic thinking. This is especially important as our country moves away from a manufacturing economy into a more knowledge-based economy. Teachers can no longer be content just helping their students gain baseline levels of knowledge, they need to help them use the knowledge that they gain in new and innovative ways. In my school, time would be set aside for interdisciplinary, creative collaboration. Partnerships would be formed with community members through the form of mentoring opportunities and community-based projects. The focus of these projects would be to get students to experience real projects with concrete outcomes. These problems would also be helpful in increasing just-in-time learning as students would need to direct learning in order to overcome certain gaps in their knowledge. The mentors from the community would also be able to help the students identify resources that they might be able to use to accomplish those projects. I don’t want the focus of innovative activities to be all about entrepreneurship and making money (although I wouldn’t say that was a bad thing), rather I want it to be about the process of knowledge creation. Rather than having students sit on the learning that they’ve accumulated, I want to foster higher levels of cognitive abilities by having students utilize their knowledge in meaningful ways. One important emphasis that I want to have in my school is a focus on 21st century skills. The most important of these I feel is learning to code and to curate of one’s digital identity. I’ve been closely following the push for coding classes in school and I don’t feel that I’ve seen a lot of progress in its implementation. I think that we should teach code in the same way that we immerse students in language. Not only are we seeing more and more jobs in the software development arena, but I think that learning to code will become a new type of literacy. Not in the way that we will need to know how to do it to interact with culture, but rather by being able to do it our students will be in control of so much more in their life. Rather than being just consumers of the internet, they can understand the language of the internet, even speak the language of the internet. I think that one of the most difficult challenges to this portion however, will be to get instructors who can teach the content. Software Developers get paid a lot more than teachers, and software developers probably aren’t the best instructors of K-12 students, so we would need to come up with some creative solutions to overcome that gap, but I think by having this immersion, our school would be able to do some extremely innovative things. In conjunction with this, I would also like to take some time helping students curate their own digital identity. Every student would be issued a domain and hosting. This would be their own sandbox to which they could write code, host a website, keep a blog, etc. This would be based on the ideas of the “Domain of One’s Own” project out of the University of Mary Washington. I feel that by having students curate their own corner of the internet, we will be able to empower them to do some really innovative things. I feel that getting support from the stakeholders on this project would be a challenge at first, but it would be something that I would be able to overcome. I feel that this model is not trying to overthrow the current model of education, but rather it is trying to reframe it a bit. In my school, we would still be covering the content that was previously covered, however, now we would be utilizing personalized and adaptive technologies to make the learning of this content more efficient. That efficiency, would hopefully pay off in greater ability to create more learner-directed study paths. By allowing student to pursue areas that interest them, while at the same time providing sufficient scaffolding through teacher and mentor interaction, I think that we would have a model that would be appealing to both students and their parents. We would most likely have to provide evidence that this model was still paying off in high test scores for the students, but I think we would see them because students would be more intrinsically motivated to learn the content. As for learning 21st century skills, I think we would have a fairly easy sell there. Even looking at the video available on code.org is a good sell for anyone to have their children learn to code. Learning the language of development can open up new worlds to our students — I think this would translate into increased student success, as in many ways learning code can help increase the problem-solving abilities of students. While these components that I have discussed in regards to my school are just a few of the components of my potential school, I really feel that they set the tone for the environment that I want to cultivate. What do you think? Do you think it would work? Do you think there are any areas that I would get major push back? Do you think that coding or digital identities are important 21st century skills? In preparation for next week’s discussion on educational gaming, we were given the assignment of finding an educational game, playing it, and then reflecting on the process. Since, I don’t have any educational board games at home (and I loathe the moral relativism of Apples to Apples), I did a bit of digging around the internet and the iOS app store and I eventually found two games which were made from the same developer: Dan-Russel Pinson. 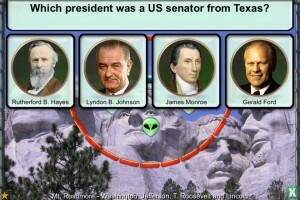 The games are that aptly named Presidents vs. Aliens and Stack the Countries. Now while I wasn’t planning on reviewing two games, I chose to evaluate both of them because the model on which they are based are fairly similar. Both Presidents vs. Aliens and Stack the Countries seem to be very similar in terms of their purpose, structure, and game play. In PVA, players are presented with a Breakout-style puzzle filled with alien heads. In order to shoot get rid of the aliens, they need ammunition in the form of presidents heads. They receive these heads by correctly answering presidential trivia questions. 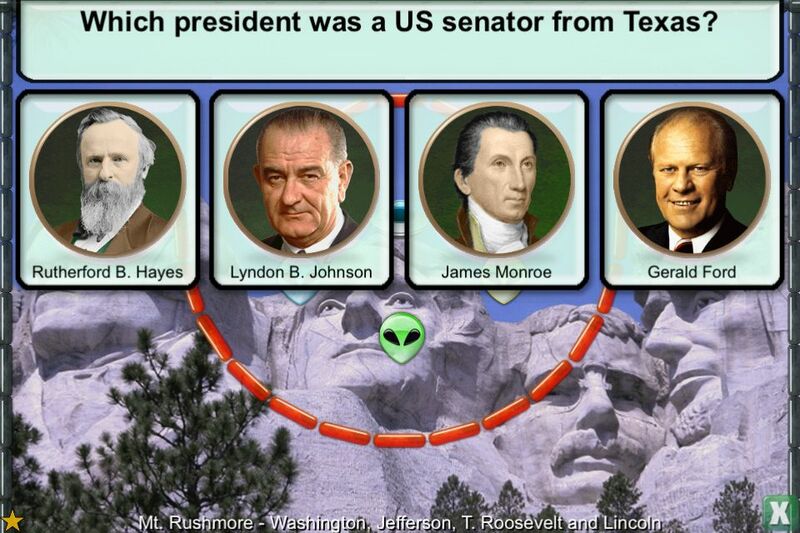 Once they answer a question right, the player is then able to shoot the presidential head toward the alien. In order to complete any given level, the learner may have to answer several questions correctly to get the tools necessary to achieve the objective. Now while the gameplay in Stack the Countries is not an exact mirror of PVA, the goals are very similar. 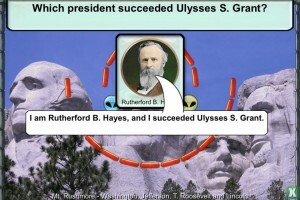 Namely that the student must complete trivia questions in order to get access to play the actual game. In this case, the learner is answering questions about world geography in order to get countries that they can then stack in a pile. Once the countries are stacked to a designated threshold, the learner completes the level. 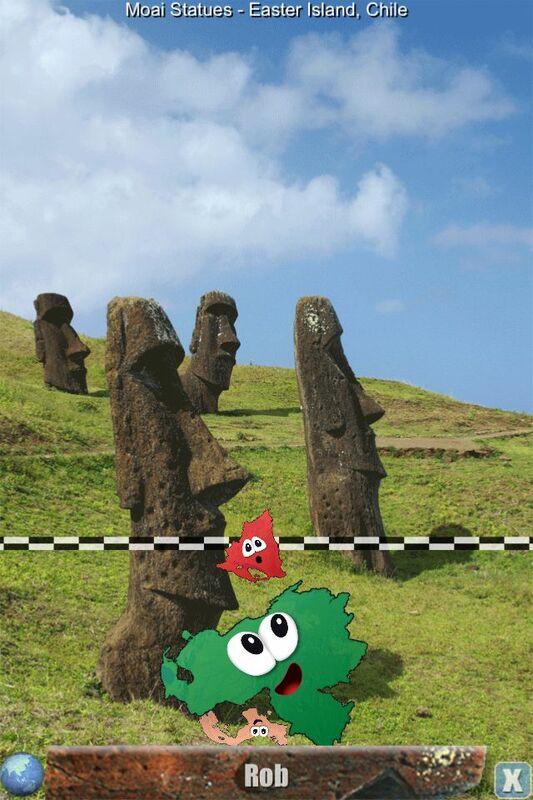 What is unique about this stacking process, however, is the fact that countries are given to the player in their to-scale size (ie Canada is really big, and Barbados is really small), and that there is a physics engine which determines if countries can stack on top of each other or topple off of the platform. 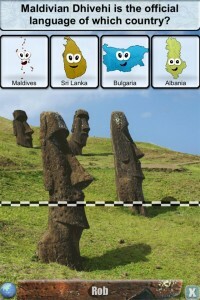 A question in Stack the Countries. I actually got this one wrong. Before laying out any particular criticisms, I should note that I am a 33-year old man and am probably not the target audience for either of these games. I’m assuming that the target age of these games is probably somewhere around middle school — and it would be interesting to see tween views on the game, but since I only have a 2 year-old and a 3 month-old, my views will have to do. It is evident in looking at both of these apps, the model is strikingly similar. In both games, play acts as an extrinsic motivation (It reminds me of computer time that a teacher would offer to a student if they do their work). The learner must complete the learning task in order to engage in the more playful task. Now while I feel that a lot can be gleaned from the educational portion of the game, I worry that by having such a dichotomy, that the learner will see the educational portion as the necessary evil in order to get to the part that they want to do. I feel that this tends to be a recent issue in the so-called gamification of learning. We rely too much on the extrinsic motivation, and assume that will be enough for our students to be successful. More focus should be given to make the learning intrinsically motivating. I think this can be done by integrating the educational portion more into the game play. Learning should be goal oriented: While both games are goal oriented, there seems to be little alignment between the learning outcomes and the play outcomes. In these games the students engage in learning, so that they can play. Rather than simultaneously engaging in learning and play. Learning should be contextualized: While there is an attempt at learning in these games, it does not seem to be contextualized. I interpret a contextual learning environment as a place where you learn in order to meet specific goals. In AVP, you do learn in order to meet goals, but the connection between the learning and the goals is arbitrary and designed by the game maker. Learning should be active and interactive: One of the things that I noticed in playing the game after a few minutes was that I was becoming bored with the content. While the play activity was increasingly challenging, I sensed that the educational portion would be static. I was just answering a bunch of questions from a large question bank — they weren’t going to be getting harder as I was going along. In AVP especially, there seemed to be an emphasis on memorization rather than skill development. Memorization in this way can lead to passive learning, and it was difficult to engage with. Learning should provide adaptive challenge and support: As I mentioned above while the play got progressively harder, there was no adaptive changes in regard to the content. Learning should incorporate feedback: One of the things that I noticed about AVP was that there was some feedback when you answered questions right, however, the nature of this feedback wasn’t that helpful. The feedback would basically reiterate the question, rather than elaborating on it. 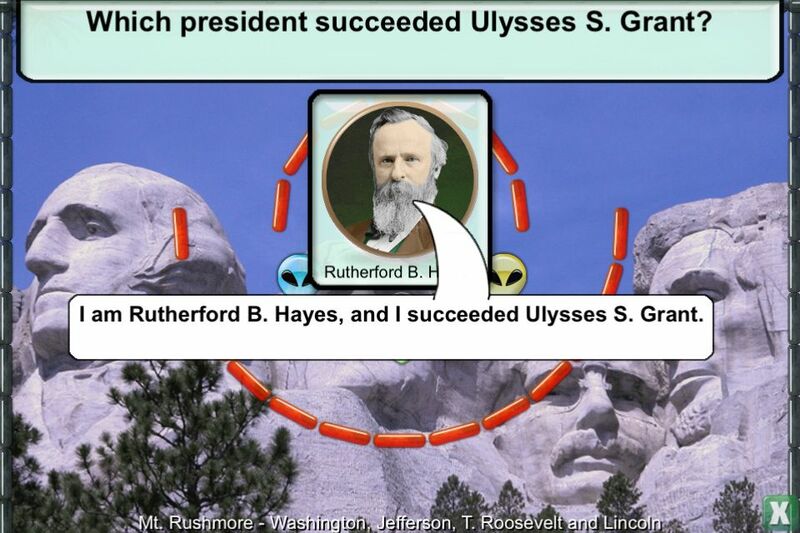 If the purpose of the game is to help students build schema about presidents (which I assume it is), the game needs to take opportunities to provide feedback to the learner to further engage them in that world. I think that the same thing could be said for Stack the Countries. I didn’t intend the purpose of this post to be to lay into Dan-Russel Pinson for the work that he’s done, but rather it was intended as a thought exercise for myself. While there are many games out there that claim to be educational, we need to evaluate how the play elements are being incorporated with the educational elements. If we just tag the educational elements on, our students will gradually disengage, as I saw myself doing with these games. If we can provide immersive experiences that match educational goals to play goals, I think that we can be more successful in drawing students into these experiences. Shute, V. J., Rieber, L. P., & Van Eck, R. (2012). Games…and…learning. In Reiser, R. A. & Dempsey, J. V. (eds.) Trends and issues in instructional design and technology (p. 321 – 329). Boston: Pearson. This past week, I have been doing some reading from Rosenberg (2012) regarding knowledge management. As I understand it, knowledge management is a process wherein individual knowledge from an environment is codified. This can be through more formal information systems (such as Sharepoint) or through wikis, blogs, or websites. In light of this reading about knowledge management, I would like to take some time to reflect on my own process of capturing knowledge. In Twitter, I have the ability to create custom lists to keep even more specific tabs on people who I’m interested in. You can see above that I have columns dedicated to two groups: Open Ed Peoples (a list I created) and Seattle Video (a list that I subscribed to). Twitter also acts as a surprisingly good way to get a hold of people. Because it’s a bit less populated, I find that people respond to replies and direct messages pretty well. Twitter can be a hard sell to others — there is often a perception that it’s a bunch of narcissistic navel gazers. There’s certainly a lot of that, but I’ve found great value for my professional career. There are other components to my PLN, but they don’t get used nearly as much as Twitter. I used Vimeo regularly to keep up with innovative projects in the video world. I have a blog roll that I occasionally read over on The Old Reader (RIP Google Reader), and bookmarks for tech, video, and educational websites that I visit occasionally. What has become more important as I have started graduate school is the knowledge management component, how have I been codifying content from classes that I am taking, things that I am reading, and people who I am meeting. My primary method for capturing conversations and notes is through the use of Google Docs. I have not been a big Google Docs user in recent years, but I have started using it more for a few reasons: 1) I was getting tired of the bulkiness of Microsoft Word. With my 5-year-old Macbook Pro it seemed to take a few years for the program to boot up each time. Google docs is a little bit more no-nonsense. I can get into the program faster and begin taking notes, plus it is always automatically saving. 2) I bought a Chromebook — this was an experiment. 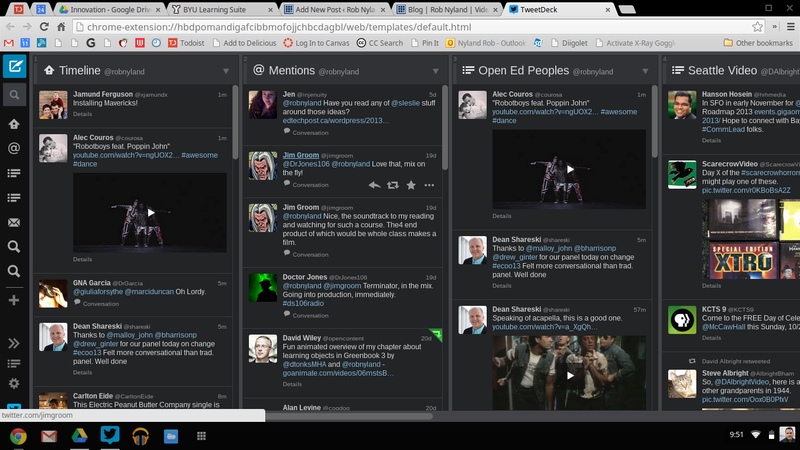 I became cognizant of the fact that most of what I was doing on my Mac was using Chrome. Chromebooks were on sale for $150 so I bought one. Chromebook ecosystems are built around Google Docs, so naturally I had to adopt it. So far, I’ve been happy with my use of Chromebook and Google Docs in my classes. Not only has it allowed me to capture all of my class notes easily, I can then easily share those notes with others. I also like the fact that Google Docs is searchable — I’m hoping that this will make efforts at finding specific content from the past really easily. One of the biggest snags with my knowledge management process in graduate school has actually been Mendeley. For those of you who aren’t aware, Mendelely allows you to organize, highlight, annotate, and share research papers. We have been using it in Dr. West’s class to store all of our readings for the semester. The big snag for me however, is that Mendeley is a stand-alone program and not a web app, thus it does not work on my Chromebook. As a result, I have had to print off several readings and highlight them (which goes against one of my original goals to have a more paper-less workflow). Another useful tool that I have found is Diigo. 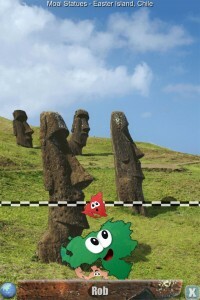 Diigo is a really multifaceted tool. I think that it initially started out as a social bookmarking tool (a website where you can store a list of public bookmarks), but has since evolved into a web highlighter. For this reason, Diigo is a really awesome tool for a graduate student. Diigo allows me to bookmark the content that I find, organize it by using lists and tags, and even highlight specific portions of the web-based text that I want to remember. Another great thing about Diigo, is that you can also create shared pools of links, so if you are working on a research project with a group, all of the members of the groups can see the resources that you’ve found and tagged. As far as personal project/task management goes, I’ve been on an ongoing quest to find a perfect solution to keep myself on top of all the projects that I am working on. I frequently visit Lifehacker and admire the elaborate systems that people use in order to keep themselves organize. I have tried a lot of solutions including Astrid (now defunct), Asana, and Things, but all of them seemed to complicated for what I was trying to do. The best and fastest solution that I’ve found is Todoist. I love Todoist for one reason: it is fast. It allows me to quickly capture to do items and assign a deadline to them. I can do this because it recognizes shorthand code in the date field. If I need to do something today, I can type “tod”, if i need to do it on Friday, I can type “fri” and it will automatically assign a date for me. It may not be the perfect solution, but I’ve been using it for a few years and it works great for me — so maybe that is the perfect solution! Overall, I would say that I’m pretty happy with my system for capture knowledge. I feel that I can adequately capture notes, conversations, and things that I read through the various tools that I have described. One of the tools that I do want to use more however, is the same tool by which you are reading these words — my blog. I feel that the process of blogging would help me synthesize a lot of the concepts that I have been trying to capture, and help me on a path towards knowledge creation in this field. I know that it’s something that I want to do, but it’s also something that I’m pretty self-conscious about at this point. I worry that I will never be as good as some of the awesome bloggers out there, but I guess I shouldn’t get ahead of myself at this point. How about you? Do you have any knowledge management tools that you really love? Any tips for sharing that knowledge with others? Rosenberg, M. J. (2012). Knowledge management and learning: perfect together. In Reiser, R. A. & Dempsey, J. V. (eds.) Trends and issues in instructional design and technology (p. 158 -168). Boston: Pearson.